Did you know that you don’t have to live or spend time in a Spanish-speaking country to be fluent in Spanish? With a little dedication and creativity, there are lots of ways that anybody can practice Spanish without having to invest extra time, money, and resources into travel. Here are five smart ways to practice Spanish without having to leave the county. Most cities and towns will have areas or shops where Spanish is spoken on a regular basis, and these neighborhoods are a great place for anybody to hone their speaking skills without having to foot the cost of a plane ticket. By practicing ordering food and paying for groceries in Spanish, you will be polishing up on the basic conversation skills you absolutely need to know. That said, don’t be shy to pipe up and start a conversation with a native Spanish speaker. You might just find yourself making a new practice partner before you know it! Rather than seeking out news in English, opt for a Spanish language newspaper instead. Spanish language newspapers can be readily found in most large cities, but there are lots of worthy Spanish news sources that can be found online as well. Reading the headlines while you sip your morning coffee is a great way to familiarize yourself with basic Spanish phrases that you might not encounter in a more formalized learning setting. There is no better way to pass the time when doing the dishes or tidying up than to pop on a podcast. Next time you put on that headset, challenge yourself to listen to a Spanish-speaking podcast. Even if you don’t feel like you understand much, you will be surprised at how much you start picking up on the storylines as time goes on. The fact that most basic technological devices that we rely on from day to day, like our phones and laptops, have language settings that can easily be adjusted means that simply switching your language settings to Spanish on your devices will provide easy exposure to Spanish throughout the day. Writing can be one of the most difficult obstacles to master when it comes to learning a language, and there is no better way to motivate yourself to practice than to put yourself out there. By keeping a weekly Spanish blog, you will not only push yourself to pick up new language skills and master tricky grammar, but you will have the added perk of addressing a live audience who can respond with helpful feedback, tips, and advice. Practice is a great way to learn, but anybody who wants to learn Spanish also needs a strong foundation to start from. Medita Spanish is the world’s 1st language and guided meditation app. We use a mix of guided meditations, mindful practices, and NLP techniques to create the perfect learning environment to you learn to speak Spanish effortlessly. Come check us out today to find out more. 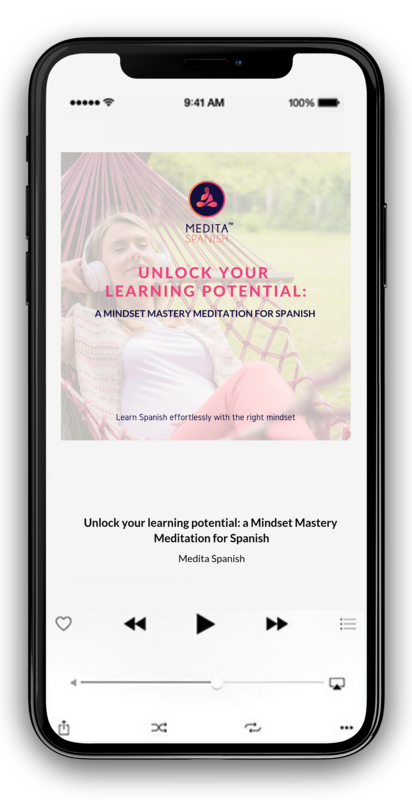 Unlock your learning potential: A Mindset Mastery Meditation for Spanish.